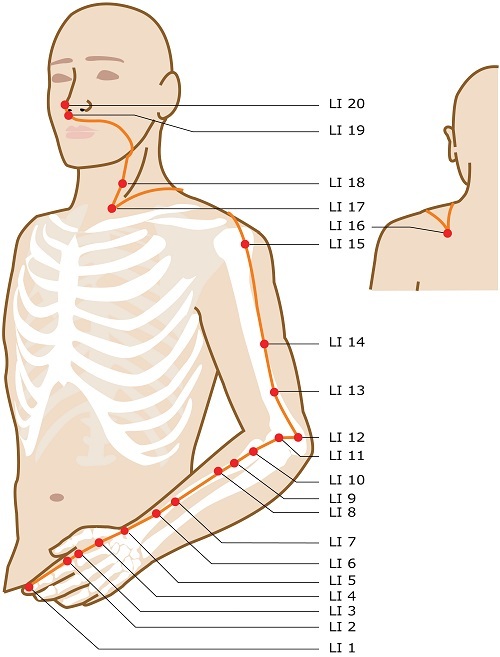 What acupuncture points are located on your hands and arms? 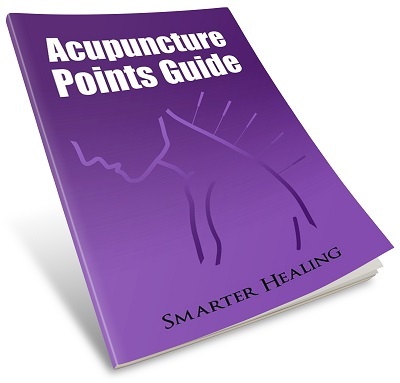 On this page I'll show you acupuncture meridian images from our acupuncture points guide that show you specifically the points located on your arms and hands. 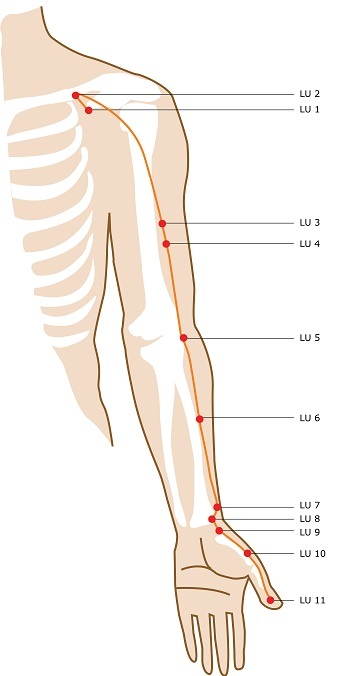 There are six different primary meridians that contain acupuncture points found on along your arms and hands. These six meridians are: the heart, ​large intestine, lung, pericardium, small intestine, and the triple energizer meridian. A few of the points from these meridians are also found on the back of the shoulder within the Yang Motility Vessel. The Yang Motility Vessel is not a primary meridian and doesn't have its own points. It's known as an "extraordinary" meridian or energy "vessel" and is an energy pathway that only flows along points found in other primary meridians. Acupuncture Points: Right Hand vs Left Hand? Every acupuncture meridian in the body is symmetrical. The acupuncture meridians you see in the images below are only shown on one side of the body, but they actually exist in the exact opposite location on the other side of the body. This means that every acupuncture point on the right hand is also on the left hand. Every point on the right arm is on the left arm. And every point on every other part of the body is also symmetrical. So don't worry about which side you are using for treatment, right or left. They both affect the same energy pathways and will have similar effects on the body during acupuncture treatments. You should only be concerned about right vs left if your acupuncturist or another expert has diagnosed you with a problem that requires a specific side of your body to be involved in your energy healing treatment. Now that we've got the basics out of the way, let's take a look at the acupuncture points on your hands and arms. As you can see, the entire heart meridian lies along the arm, hand, and tip of your little finger. Next up is the large intestine meridian. This meridian features most of its points along the arms. However, it also has a pathway that continues to the back of the shoulder, and then up the neck and onto the face. ​As you'll see further down the page, the two points from this meridian that are located on the side and back of the shoulder are also points that make up part of the yang motility vessel. And now the lung meridian. This meridian's points start at the shoulder and then work their way down to the tip of the thumb. Next we have the pericardium meridian. This meridian's points lie entirely along the arm. Now let's look at the ​small intestine meridian. As you can see, about half the points in this meridian lie along the shoulder, arm, and hand. Now for the last primary meridian containing points on the arms or hands, the triple energizer. Just like the small intestine meridian above it, the triple energizer meridian has a pathway that extends from the face, down the shoulder and onto the arm and hand. The pathway ends with its last point at the tip of your ring finger. Finally, we have the only extraordinary energy vessel that contains points near your shoulder, the yang motility vessel. This extraordinary vessel doesn't contain any unique points. No extraordinary vessel does. The extraordinary vessels are just energy pathways between points that are found in other meridians. This meridian really doesn't even have points on the arm itself. But since it has three points that are found on and around the shoulder at the top of the arm, I figured I might as well include it in this list just to make sure I covered everything. As you can see from examining the meridian images above, all of the primary meridians that travel along the arm have pathways that include points on the wrist, as they take their journey down to the fingertips. The wrist is a popular spot for amateurs and enthusiasts to use for acupressure. This is probably because you can easily apply pressure to your wrist while out in public without people noticing and asking what you're doing. After all, acupuncture and acupressure ​aren't mainstream enough to be considered perfectly normal to perform and talk about in public, at least not with everyone. Most people are still skeptical about the power of acupuncture or acupressure to heal your body. However, that hasn't stopped consumers from trying just about anything to cure their ailments, including even creating acupressure wrist bands that are intended to treat a variety of different health conditions. Just see for yourself the list of products available. I haven't personally used an acupressure wrist band before, but if you read the reviews, there are certainly many people who swear by them. The most common ailment treated by them seems to be nausea. If you're interested in self-applied acupressure, you can check out our huge acupressure points guide. It has a big list acupressure points that are used for treating various health conditions. Many of these health conditions include acupressure points along the wrist which you can use discretely throughout your day to relieve pain and discomfort.